The requirement for master key systems is normally associated with a desire to rationalise key holding. Without one, in a busy environment keys and lock types can proliferate, and key holders can find themselves carrying dozens of keys on their person due to a lack of organisation. The problem here is that keys can go missing and time can be wasted trying to figure out which key matches which lock. With our range of master key systems however, you can reduce the number of keys users have to carry, and when planned correctly, they can provide the system manager with years of trouble free administration of keys and locks. Our master key systems are especially perfect for buildings such as schools or offices where there may be lots of different locks with separate keys. At Keytrak, we pride ourselves on tailoring our systems to meet your specific requirements, making the changeover as stress free as possible whilst also providing you with an efficient and safe security solution. In addition to this, our team of highly experienced and skilled locksmiths can help you to plan, install, maintain and future proof your systems. Standard master key systems consist of any number of cylinders that are all supplied with their own individual keys but which can also be opened by an overriding master key. By installing master key systems in your premises, you’re investing in a high quality security solution that takes the hassle out of carrying multiple keys and reducing the risk of them getting misplaced. Basic master key systems comprise of a master key which passes a group of locks, each with its own separate ‘differ’ key. A larger group of locks however may require dividing into departments for example, and each departments’ locks would then have a separate ‘sub’ master key which would pass the locks in that department but not the locks in other departments. Our systems would of course still pass all locks in all departments. Example 1: A block of 12 flats has a master key which passes through all locks. Tenants would be issued with a key that operates their individual flats but each tenant key would also pass a ‘common’ cylinder fitted to the external entrance door to the flats. Another key may be allowed to access the main entrance and a cleaners cupboard only. Example 2: A high school has six departments and ten buildings. The site manager requires one master key that passes all locks. He requires six sub master keys, each one passing locks in the relevant department. Each classroom has its own ‘differ key’. Sub master keys are then issued to the relevant Department Head and ‘differ keys’ are issued to teachers so that they have a key to their own classroom. Separate keyed alike locks still passing the master key are fitted to cleaners cupboards, another keyed alike set to store cupboards. Main entrance doors are also fitted with keyed alike locks which remain outside of the main master key systems due to the consequences of a master key being mislaid or stolen. In these circumstances, only the outer door cylinders would need to be changed, making our systems one of the most efficient type of key system available on the market today. At Keytrak we can provide master key systems which are tailored to your individual requirements and budget. 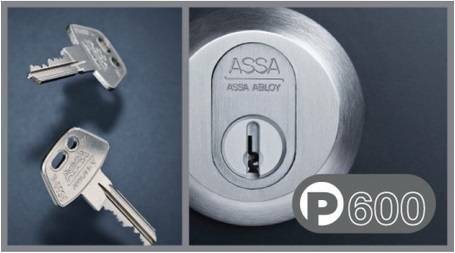 By choosing Keytrak, you can choose from patented master key systems from leading brands such as Assa, Abloy, Mul t Lock, Evva and ISEO. A Patented mechanism and key blank affords many years of protection against unauthorised key duplication. For more information about our systems and services, please do not hesitate to get in touch with our expert team today! Our central location enables us to offer our services throughout the UK, including Manchester, Liverpool and Warrington. At Keytrak we pride ourselves on delivering high quality security solutions which help to keep properties safe and secure at all times.